It is my nephews birthday today (14) so of course I made lunch for him. He likes chess so his sister suggested this theme. I decided to make pizza but struggled a little to make it look like a chess board. (I also gave my nephew the rejects.) The way that worked the best for me was to cook the crust with just the pizza sauce and put the cheese on top afterwards. 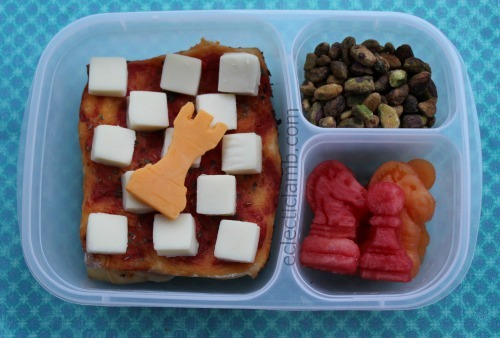 This entry was posted in Bento / Cute Food, Food and tagged chess, Cookie Cutter, EasyLunchboxes, pizza. Bookmark the permalink. This is a unique lunch theme! I love that you come up with ideas like this for your family members. Thank you so much! I enjoy making themed food for my family and friends.